Get in shape! Lose weight! Live a healthier life! WIN GREAT PRIZES!!! FREE for Y members, only $80 for non-members! Click here for membership details or stop in today for a tour! The contest is designed for anyone who wants a jump-start on their fitness goals. Sign up for the Biggest Mover and turn your new fitness goals into a long-term lifestyle that is more fit and healthy. Get Moving with Group Fitness! After 8 weeks, the person with the most points wins. Weekly drawings that everyone goes in, as long as you turn in your workout card. Grand prize is awarded to the member with the highest number of total points at the end of the contest period. You have 8 weeks to WIN BIG! Grand Prize: Fitbit VERSA! Participants can enter the contest at any point during the 8-week contest period. Participants earn 1 point per group fitness workout completed. Participants can earn up to 5 points per week. The participant must have the instructor initial the weekly Workout Card in order to receive a point for each workout. Participants earn 1 point per week for the social media challenge. See the Membership Desk for the weekly challenge and to have your card initialed. Participant must show proof of completing the challenge. Participants earn 1 point per for the nutrition challenge. See the Membership Desk for the weekly challenge and to have your card initialed. Participant must show proof of completing the challenge. Participants earn 1 bonus point for referring a qualified guest to a group fitness workout during the course of the competition. A qualified guest is a non-member who lives locally and has a realistic possibility of becoming a member during the contest period. The participant must complete a Referral Card in order to receive bonus points. Bonus points are not subject to the 5-point weekly maximum. Participants earn 5 points for any direct referral who becomes a member during the contest period. Any participant who receives at least 1 point (regular point or bonus point) in a 1-week period of the contest will be entered in the prize drawing for that week. Each participant’s name is entered only once per weekly drawing. At the end of the 8 weeks, the participant with the most total points (regular points plus bonus points) will be awarded the grand prize. In the event of a tie, the winners will be determined by drawing names. 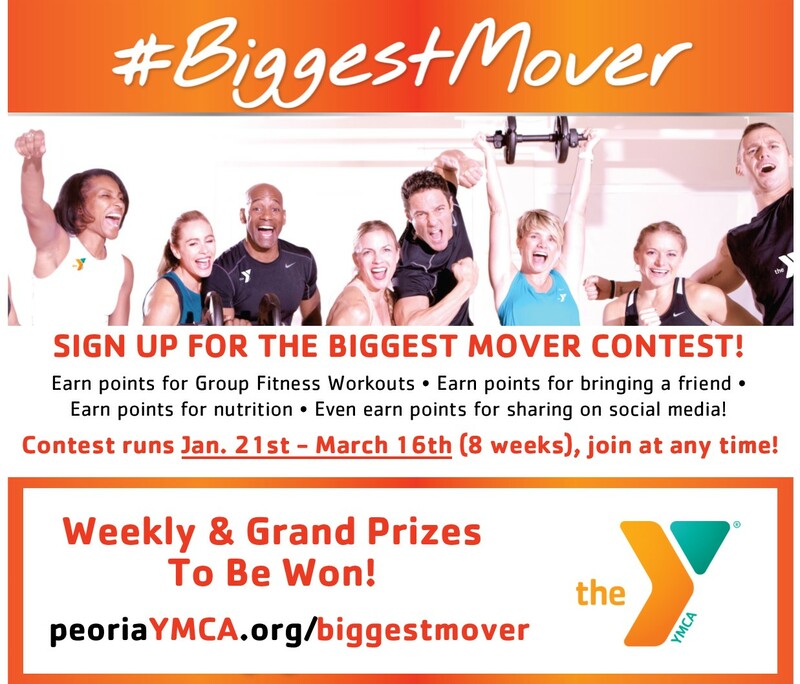 Greater Peoria Family YMCA employees and their immediate families may participate but are not eligible for prizes.